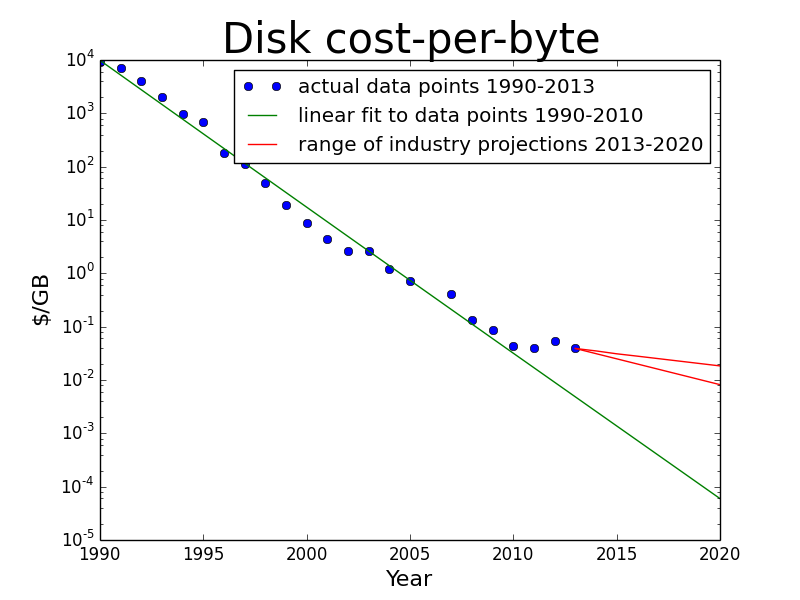 Disk storage costs in 2014, two and a half years after the floods, were more than 7 times higher than they would have been had Kryder's Law continued at its usual pace from 2010, as shown by the green line. 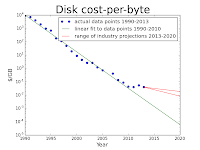 If the industry projections pan out, as shown by the red lines, by 2020 disk costs per byte will be between 130 and 300 times higher than they would have been had Kryder's Law continued. 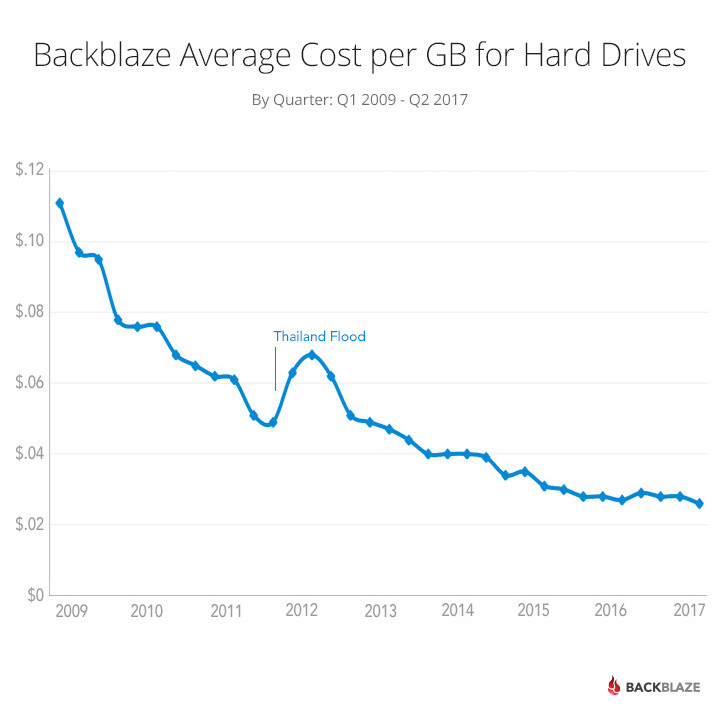 Thanks to Backblaze's admirable transparency, we have 3 years more data. Their blog reports on their view of disk pricing as a bulk purchaser over many years. It is far more detailed than the data Preeti was able to work with. Eyeballing the graph, we see a 2013 price around 5c/GB and a 2017 price around half that. 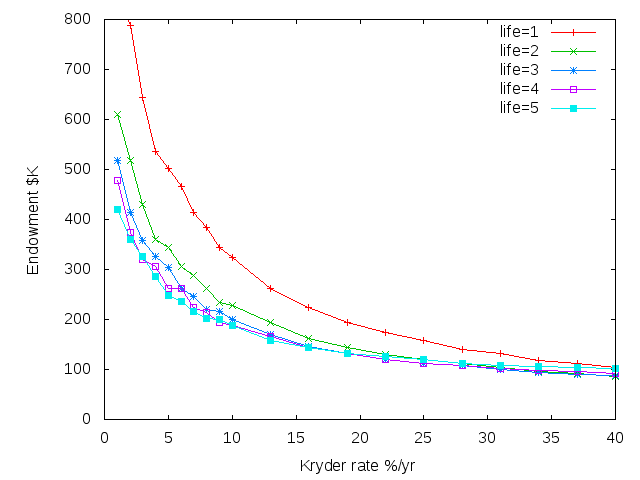 A 10% Kryder rate would have meant a 2017 price of 3.2c/GB, and a 20% rate would have meant 2c/GB, so the out-turn lies between the two red lines on our graph. It is difficult to make predictions, especially about the future. But Preeti and I nailed this one. 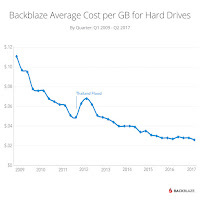 The real cost of a commitment to store data for the long term is much greater than most people believe, and there is no realistic prospect of a technological discontinuity that would change this. As usual many thanks for the interesting data and insights. 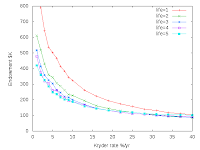 Most "hockey stick" curves are actually the initial segment of an S-curve. And indeed for cost-per-TB that is becoming clear. As to me, I also deal with archives, but also with warmer data, and my pet-peeve is with cost-per-IOPS-per-TB, as my curse is often to have to decatastrophize storage systems built with ridiculously low IOPS-per-TB of total capacity. Another reason for back-patting is Don Clark's Why a 24-Year-Old Chipmaker Is One of Tech’s Hot Prospects in the New York Times.